A new image captured by NASA’s Mars Reconnaissance Orbiter (MRO) this week further illustrates exactly what happened during the Schiaparelli lander’s crash onto the surface of Mars last week. By the looks of the impact and the formation of patterns characteristic of a small crater, the new image provides more support that Schiaparelli’s thrusters shut off prematurely and caused the lander to experience a fatal drop to the ground. The latest image, taken Monday by the HiRISE camera on the NASA orbiter, shows three impact locations that are within 0.9 miles of each other — areas where Schiaparelli’s hardware hit the dirt. Last Thursday, MRO was able to snap a few photos of the presumed site where Schiaparelli was thought to have landed, using its low-resolution CTX camera. 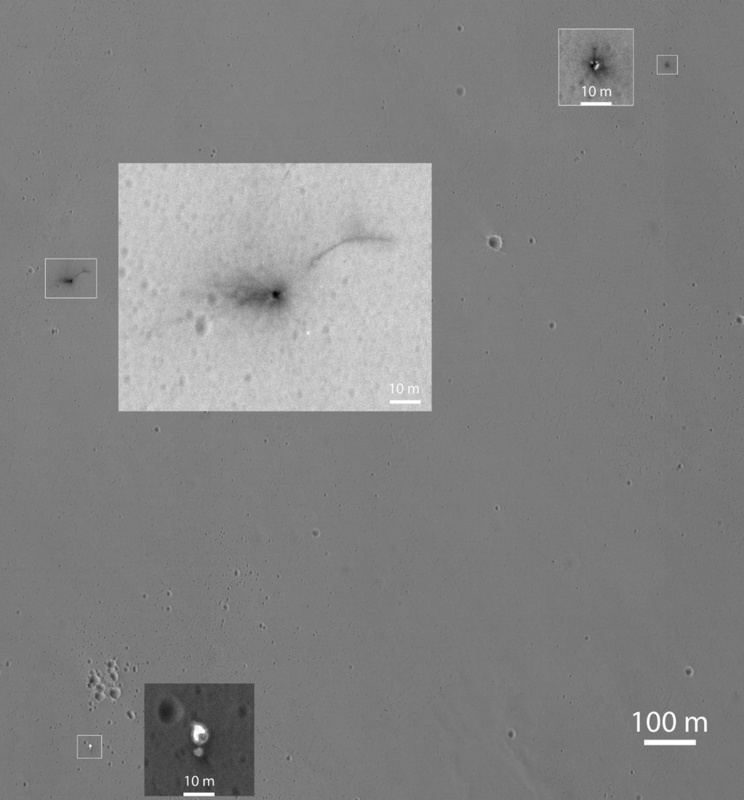 Those images were the first evidence to suggest Schiaparelli exploded as it landed on Mars, but European Space Agency (ESA) officials were more eager to see what MRO could find using HiRISE — the highest-resolution camera onboard the orbiter. This Oct. 25, 2016 image from the HiRISE camera on NASA's Mars Reconnaissance Orbiter shows the area where Europe's Schiaparelli test lander struck Mars, with magnified insets of three sites where spacecraft components hit the ground. It adds detail not seen in earlier imaging of the site. The dark, circular feature is where the spacecraft seems to have landed. A series of rays protruding from that site are indicative of a hard landing, like a meteorite. Earlier this week, an ESA official expressed his hunch that a computer glitch caused Schiaparelli’s thrusters to shut down early — and the HiRISE image bolsters that theory. An asymmetric amount of debris at the crash site seems to have been strewn into one location. In a news release, ESA speculates that a hydrazine propellant tank blew up in a specific direction upon impact. The lander’s heat shield seems to have landed about 0.8 miles to the east, and the parachute just 0.8 miles south of the crash site. Both items were ejected from Schiaparelli earlier than they were supposed to be, at an altitude between 1.2 and 2.5 miles. MRO will be collecting more images in the next couple of weeks, and ESA hopes analysis of those photos will help flesh out the investigation behind Schiaparelli’s lost contact more clearly. It’s still unclear exactly what would have caused the lander’s thrusters to shut down early.